All of our roller shutters are available for installation with in minimum duration. We can meet emergency requests if doors are required urgently with rapid turn around and installation to secure your property. Our aim is to meet your requirements at all times. Our professional roller shutter installers can provide domestic installations across Butterworth, Penang and surrounding areas. 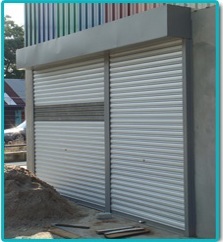 We will be pleased to assist you with any roller shutter sales or installations. We are the perfect choice for any emergency shutter repairs including industrial door repairs and sectional door repairs. From time to time it may be necessary to seek roller shutter repairs. This may be due to technical issues, misuse or potentially due to attempted illegal entry to premises. We provide an emergency callout repair service if necessary, giving you peace of mind from knowing that your shutter emergency can be taken care of quickly. Our team of qualified specialist engineeers are vastly experienced to ensure that work is carried out to the highest standards. Just give us a call and we will quickly provide you with information and quotations for any type of roller shutter repairs. To promote longer product life and to achieve maximum performance out of your door and operator we recommend servicing every 12 to 18 months. Our service team have decades of experience with all types of garage doors and operators and are able to recommend the most effective option when repairing your door. Inspection by one of our engineers will result in the correction of any faults at an early stage. 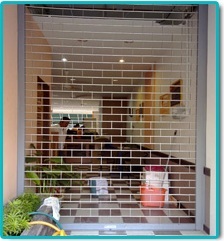 It ensures that the door is in a safe and efficient condition. We can arrange for you to have your roller shutter inspected and serviced by one of our engineers from as little amount we can provide. Please contact our office for any queries related to service bookings and repair costs. We supply all types of security roller shutters which are solid steel and aluminium roller shutters to choose from, as well as partially see through and fully see through roller shutters for domestic and commercial applications, from residential garage roller doors, window roller shutters to shop front roller shutters and industrial unit shutters. All are available in standard finish or powdecoated to your exact colour requiremnts. All our roller shutter doors are available in electric or manual operation, the electric option comes complete with a secure keyswitch or remote control and can have a manual overide facility for use in a power failure. The normal lead time for a roller shutter is within 1 week from your order, we have in emergency situations supplied and installed a standard roller shutter next day so whatever your requirements we will try to work to them, you as the customer are important to us.